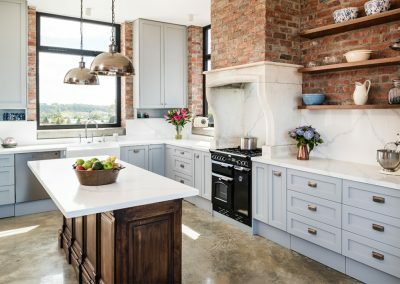 The home featured here underwent an extensive fit-out by Smith & Smith Cabinet Makers, who constructed a stunning kitchen, library, billiard room bar and vanities, making the home look every part the English Manor House. 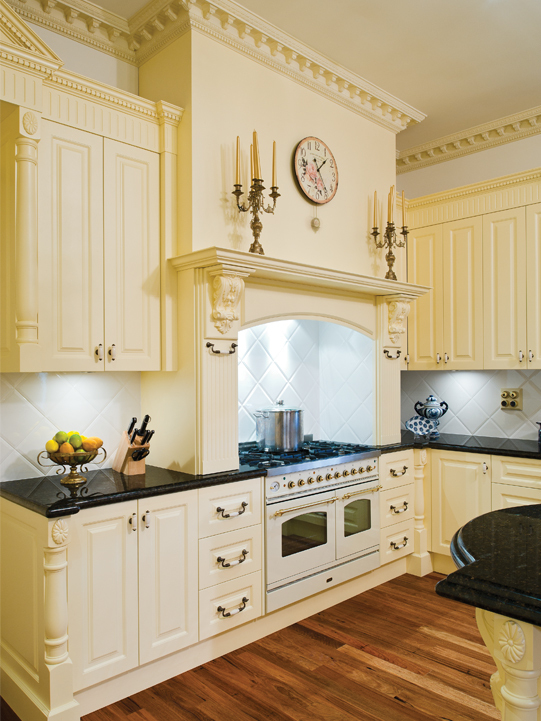 Reminiscent of the highly detailed workmanship of renowned 18th century British designer Robert Adam, the kitchen exhibits exquisite classical details, including a large chimney mantle with pull-out drawers in the corbelled and fluted mantel supports. 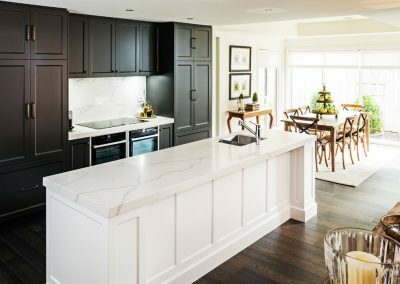 Integrated refrigerators have been surmounted by plate racks, grooved panels, dentil moulding and a pediment, and over-topped by a guardian finial. 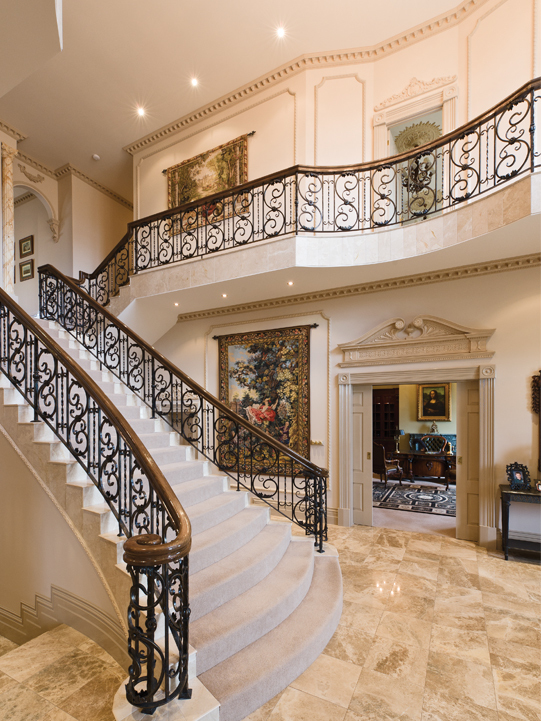 This grand edifice is supported each side by 100mm fluted columns, corbels, and the same panels and dentil moulding. 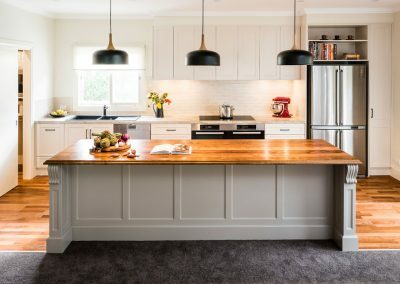 The kitchen cabinetry is 2700mm high and was finished in Dulux polyurethane textured buttercup, while all base and wall ends feature applied turned spindles that were cut in half. 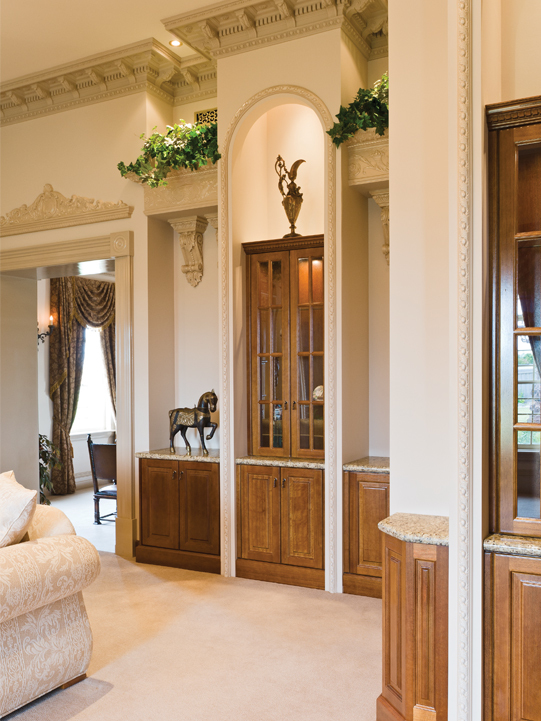 These spindle columns stand 30mm proud of the adjacent cabinetry, and are surmounted by oval cabochons. The columns are complemented by panelled ends, and in the bases, by moulded skirtings as well. 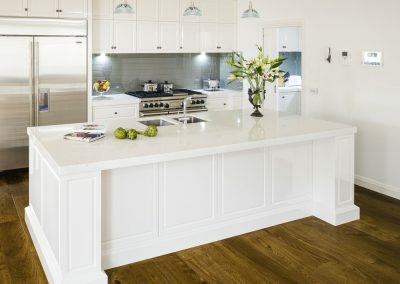 The magnificent 2700mm x 1200mm island bench dominates the room, and its imposing presence is softened by elegant curved ends, which are enhanced by corbels and spindled columns. 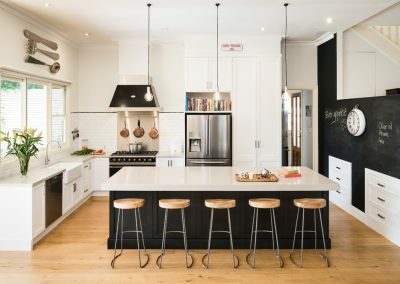 Solid panelling and skirting visually balances the 60mm-thick lambs tongue Zimbabwe Black granite and a second sink in the island bench provides an extra preparation area for large-scale entertaining. 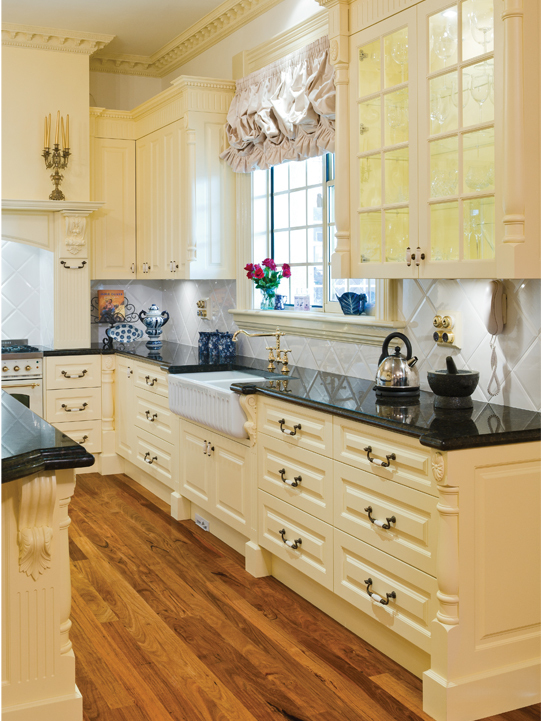 The butler’s sink stands proud of its matching corbelled and fluted columns, providing a balanced focal point to the opposite edifices of refrigerators and the colonial barred glass doors display the top-lit interiors to stylish effect. 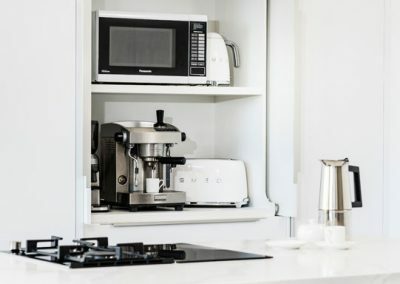 Exceptional features and appliances in the kitchen include an Ilve upright stove in a cream colour, Quasair secret rangehood, matching integrated Electrolux fridge/freezer, a semi-integrated Asko dishwasher, and Blackwood flooring. Equally superb is the library, where kiln dried Tasmanian Oak stained ‘French Mahogany‘ was used throughout to keep movement to a minimum. 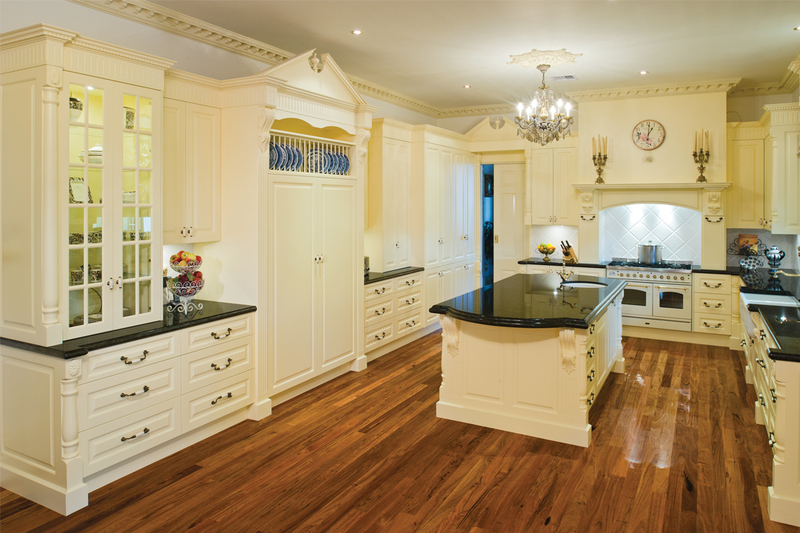 Ubatuba granite benchtops have been incorporated to complement the rich mahogany tones in the room. 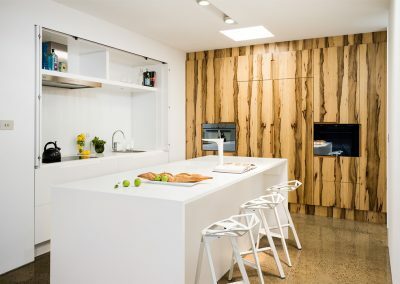 Three sides of the 7m x 5m library are covered by cabinetry and panelling to a height of 2700mm, making the room as functional as it is aesthetically appealing. 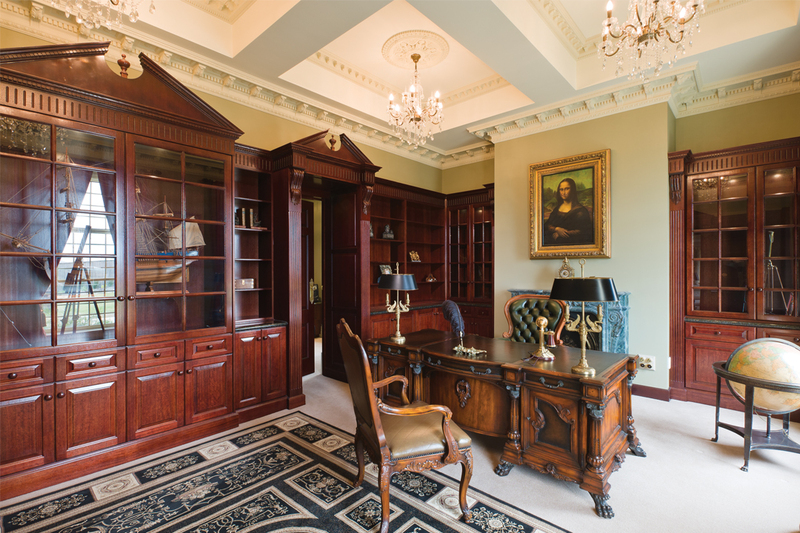 There are two entrances to the library, and both are dominated by richly panelled matching sliding doors and side panels, encased by 150mm fluted corbelled columns, grooved panels, finials and pediments, matching those used in the kitchen. There are another five 130mm corbelled fluted columns to augment each corner of the room. The fancy-edged bookshelves are protected from dust by a projecting top shelf that is inset with downlights; a thoughtful touch by the designer. These lights will eventually illuminate the hand-tooled leather books that are to be housed on the shelves. The designer also created a spectacular glass-panelled showcase of the owner’s scale model of the Endeavour, commemorating the first visit to Australian shores by one of the owner’s ancestors. All the library’s drawers are lined with green baize and have secret under-base silent closing systems, while magnificent twin suits of armour guard the grand nine-metre entrance, providing a comforting visual link for the owner to his ancestors, dating back to the days of William the Conqueror. 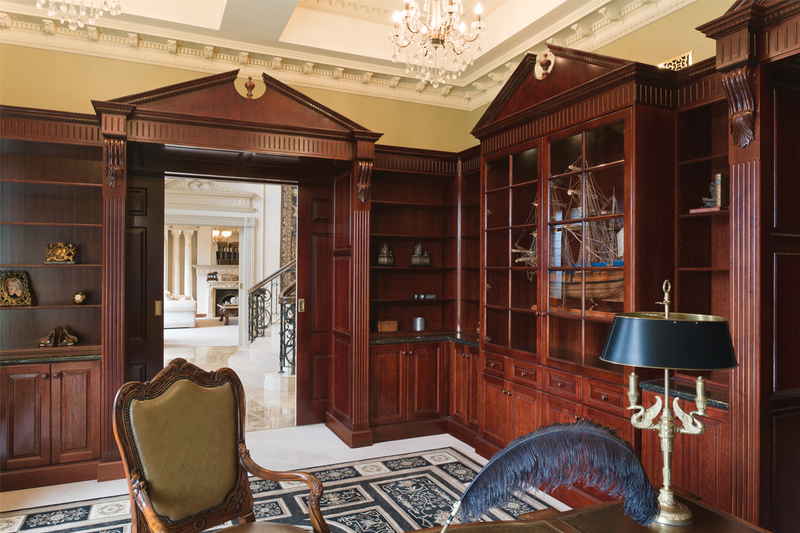 Another standout feature in this room is the owner’s leather-topped, ornately carved Florentine rococo desk and its surrounding Louis IV leather upholstered carved chairs, which provide an elegant counterpoint to this truly grand Adam-inspired interior. From here, the owner can gaze with tranquillity through to the hand-built Smith & Smith cabinetry in the ornate Florida-themed lounge room, with its sumptuous matching tone-on-tone furnishings and drapes, illuminated almost ethereally by the numerous gold chandeliers. 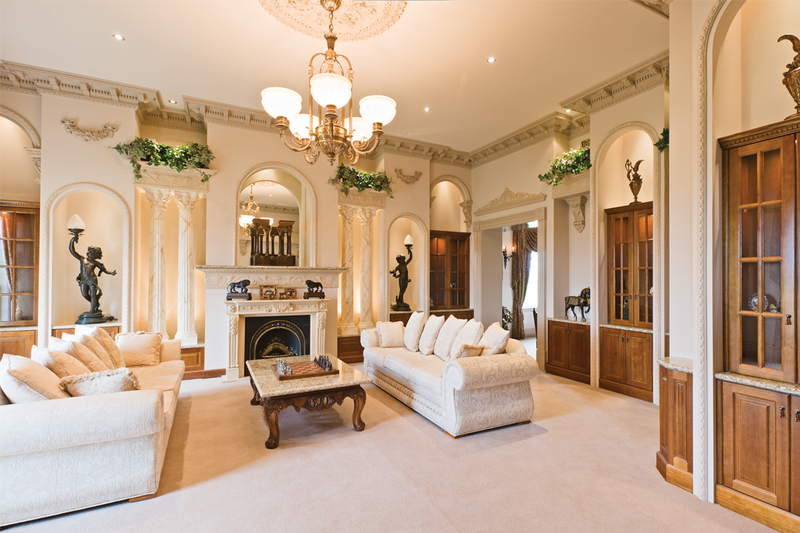 The comfort in this room is further enhanced by the French marble fireplaces and opulent plaster cornices. 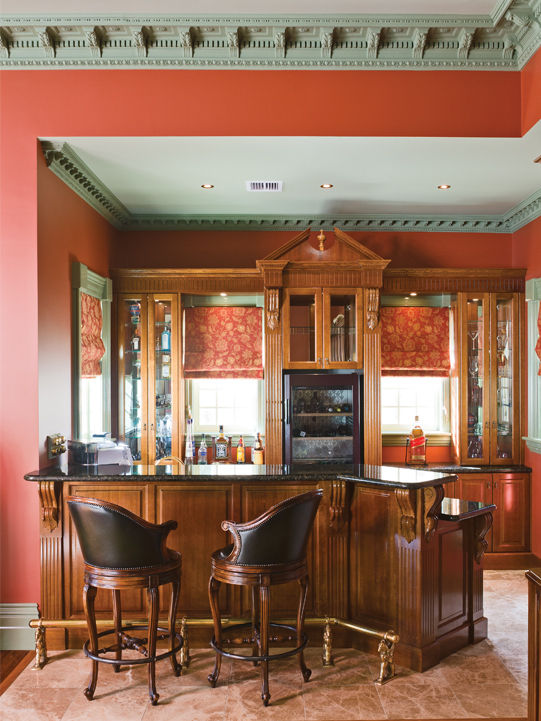 The billiard room bar has been created to match the library’s cabinetry in every respect. 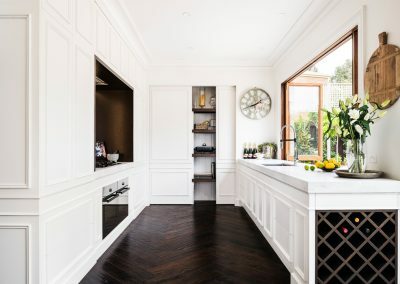 It has a central glass-fronted wine refrigerator surmounted by a back-lit cabinet with glass doors, grooved panel, pediment and finial. 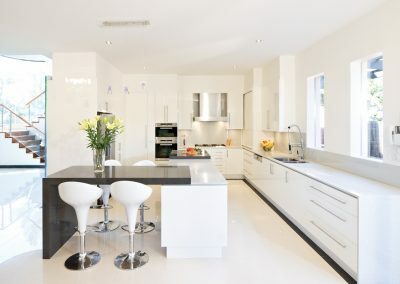 Matching cabinets with glass doors flank this eye-catching centrepiece. 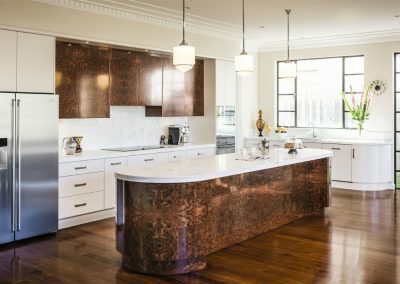 Butterfly green granite was used, with an ornate brass rail supplied by Classic Brass of Ascot Vale. Corbels and fluted columns also abound in this space. 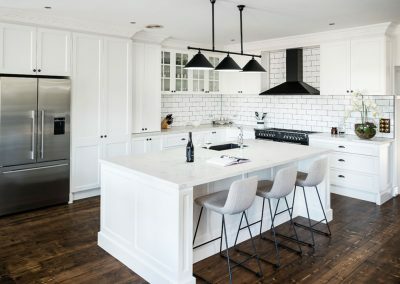 There is a full-sized billiard table in the room, as well as an ornate marble fireplace, and the Blackwood floors continue through to the kitchen. Smith & Smith Cabinets also installed the vanities in the bathroom pictured here. 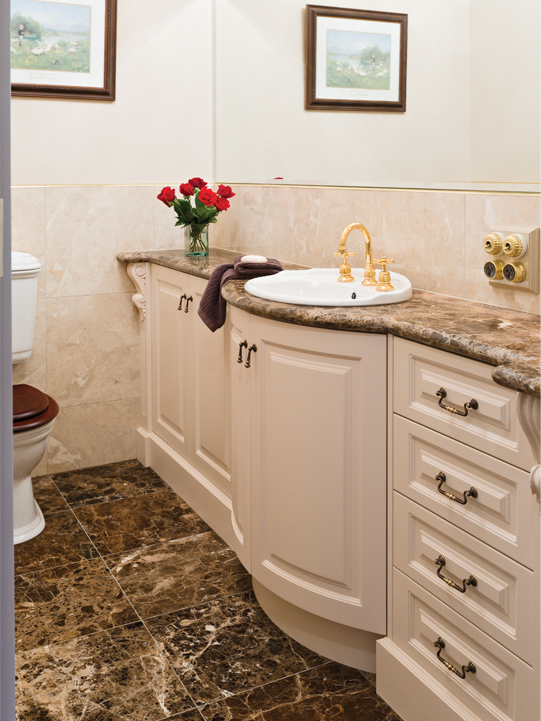 Of the six antique white textured polyurethane vanities, three have curved fronts and all have corbelled fluted columns at either end. 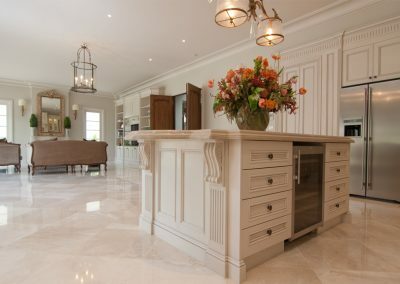 Emperador marble, recommended by the designer, was used as tops throughout, and the floors were laid with the same matching marble. 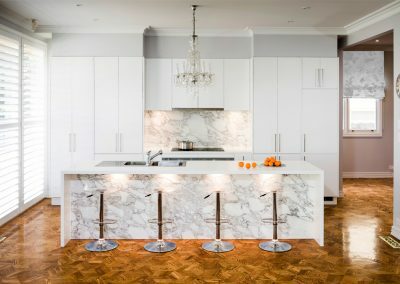 Creating space and elegance throughout each of the rooms they worked on, Smith & Smith Cabinet Makers ensured the owners’ desire for beautiful cabinetry in their wonderful new home was fulfilled. 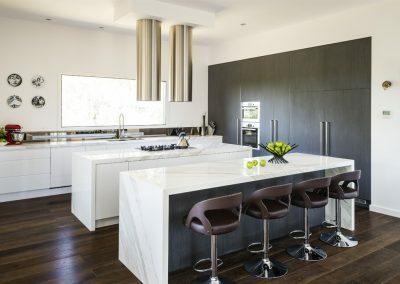 After many years in the business, they have gained a reputation for supplying quality kitchens and wall units that excel beyond their clients’ expectations. 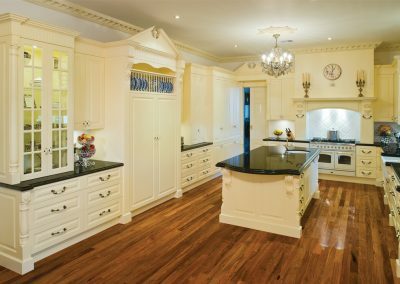 Smith & Smith Cabinet Makers can build contemporary, retro, French provincial and traditional kitchens, and also undertake work on various other interior jobs. 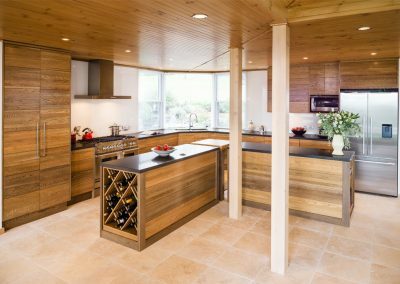 With Smith & Smith Cabinet Makers, you can expect the highest quality service and craftsmanship and work that you will truly be proud of. 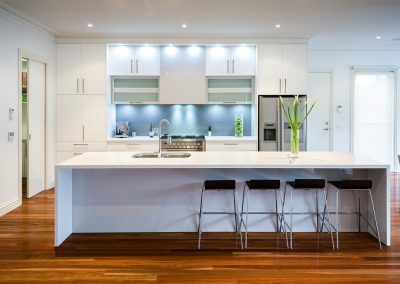 Smith & Smith Cabinet Makers have consolidated themselves as market leaders in the Victorian cabinet making industry.